Today we’ll give a rundown on the different types of handsaws out there and tips to get you sawing like a carpenter. Before you put saw to wood, you need to determine what sort of saw you’ll need for your job. 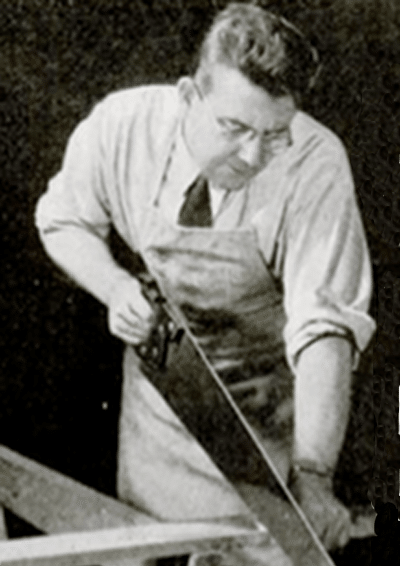 In the pantheon of saws, two basic designs exist: the crosscut saw and the rip saw. Which one you use depends on whether you plan on cutting with or against the wood grain. Let’s take a closer look at the differences between the two saws and when you would use them. Crosscut saw. If you’re cutting across the grain of the wood, you’ll want to use a crosscut saw. The teeth on a crosscut saw angle back and have a beveled edge. The teeth are also much smaller than those on a ripsaw. This design allows the saw to act like a knife-edge that cleanly slices through the wood’s grain. The crosscut saw’s design also allows the saw to cut on both the push and pull stroke. Rip saw. When you’re making a cut parallel to the direction of the grain of the wood, use a ripsaw. Unlike a crosscut saw, the teeth on a ripsaw don’t angle backwards nor are they beveled. Instead, the teeth bend left and right in an alternating pattern. This design allows each tooth to act like a chisel that chips away small pieces of wood on each push stroke. The chisel design ensures a clean cut as you saw along the grain. Also, unlike the crosscut saw, the rip saw only cuts on the push stroke, not on the pull stroke. While the crosscut saw and rip saw will cover most cutting jobs, sometimes you need an even more specialized handsaw. Here are a few handsaws you might consider adding to your toolbox arsenal. Keyhole saw. The keyhole saw is good for cutting holes for pipes, electrical outlets, or fixtures in floors, walls, and ceilings. Its narrow, tapered blade goes where other saws can’t, and its teeth can chew through tough material like drywall. Coping saw. If you’re wanting to cut curves and other intricate shapes, you need to bust out the coping saw. 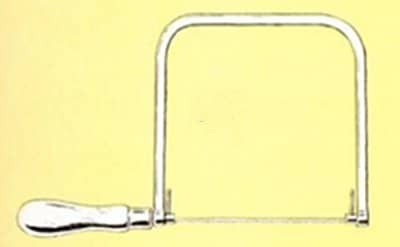 The coping saw consists of a thin metal blade set between a C-shaped metal frame. Because of its thin blade, you can easily change directions and still maintain a clean cut with a coping saw. If you want to make cuts inside a piece of wood, you can do that with a coping saw, too. Just drill a starter hole, remove the coping saw blade, insert the blade through the hole, and reattach the blade to the handle. Backsaw. Backsaws have a stiffening metal rib on the edge opposite the cutting edge. This allows for better control and more precise cutting than with other types of saws. Use a backsaw in woodworking when you need precise cuts. Different kinds of backsaws exist for different kinds of jobs. 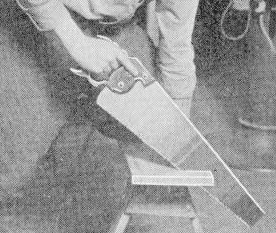 Miter saws are used with miter boxes to cut angles in wood. Dovetail saws cut, well, dovetails for joining pieces of wood together. 1. Sharp teeth. Run your thumb lightly over the teeth. If they’re properly sharp, they’ll catch your skin with little snagging tugs. 2. Straight blade. Sight along the blade to see if it’s true. Even a slight bend or bow will cause binding. Check the handle, too. A crooked one throws your arm off center, making sawing inaccurate and tiring. 3. Evenly set teeth. Squint toward the teeth from the back of the saw. If any teeth project farther than others, they’ll drag and leave a rough cut. If all teeth on one side are set out farther than those on the other side, the blade will twist. 4. Blade taper. Good saws taper so they’re thinner at the top than at the teeth. This provides blade clearance, reduces binding, and makes a cleaner cut because less tooth is needed. Taper may not be apparent, so be sure it’s specified. Watch out for saws that are just chamfered to give the appearance of a taper grind. 5. Proper flexing. Your saw should flex easily when you bend it, but quickly straighten when you let you go. 6. Built-in tension. Bend the saw with a straight edge across the blade and you’ll see a slight bow. The bow will keep trying to spring the blade back straight. This is the result of tension built into the saw by rolling and hammering the center portion. If the saw’s tension is correct, the bow should appear in a uniform curve and not look lopsided. 7. Blade crown. Hold the saw at arm’s length and sight along the teeth. You should see a slight outward curve at the blade’s center. This crown increases the cutting pressure by putting only a few teeth in contact with the wood at a time. The higher the crown, the better. 8. Balance. There are no absolute rules for good balance, but a saw should feel comfortable in your hand– not nose heavy or cumbersome. Make a series of sawing motions in the air to see how the saw feels in your hand. Mark the cutline. Remember the timeless rule of carpentry: measure twice, cut once. Measure where you want a cut (twice of course) and draw a line marking where you want the cut to be. The line will act as a guide to help you get a straight cut. 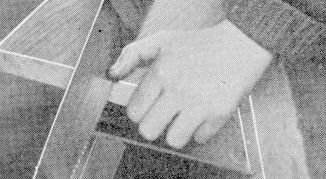 Make the starting cut.When you make the first cut, use your thumb or the knuckle of your thumb on the hand holding the wood as a guide to ensure you cut along the cutline. If you’re using a crosscut saw, start your cut with the teeth nearest the handle. This will give you the best control. Make a few back cuts until you get a nice kerf (opening in the wood). If you’re using a ripsaw, start your cut with the finer teeth furthest from the handle (near the point of the blade). Make a few short draw strokes to get a kerf going. Don’t start the cut right on the line you marked earlier with pencil. Instead, cut right next to the line on the waste side. The waste side is the part of the wood you’re not going to use in the finished product. It’s always better to have a piece of wood that’s a bit long, than a bit short. You can always sand the wood down to the pencil line. Angle the saw correctly. After you get your kerf going, you need to angle your saw correctly to get the best cut. 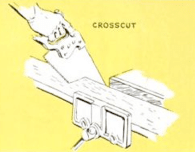 For crosscut saws, the proper angle is 45 degrees between the saw and wood. With ripsaws, it’s 60 degrees. Hold your elbows close to your body. To counteract the natural tendency to angle the blade away from perpendicular, hold your elbows close to your body when sawing. This will also help prevent you from twisting and tilting the blade, thus ensuring a nice, clean cut. Hold the saw firmly, with forefinger extended along the side of the handle. How to hold the saw. Just grip the handle so that your forefinger extends along the side of the handle. This helps you “point” the saw along the line and ensures more accurate cuts. Hold on to the handle firmly, but not too tightly. The stroke. After you’ve started the groove, a few short forward strokes will deepen the cut so you can move your left hand away from the blade. Push the saw with an easy, free-running motion. Use long strokes so that each tooth does a fair share of the work. Short strokes dull the saw faster because only a few of the teeth do the work. Resist the temptation to bear down on the saw. It won’t do anything except tire you out. Let the saw do the work. If you feel like the saw isn’t cutting properly, something might be wrong with the saw itself. For straight cuts, use a 2×4 as a guide. For many men, simply using the pencil line as your guide to cutting just doesn’t work. If you want to ensure that you get a true and square cut, place a 2×4 (or 2×2) along your pencil line and clamp it to the board you’re cutting. The board will now act as your guide to keep the saw on the line. Correcting veering. Even the best carpenters veer from the cut line. If this happens to you avoid the natural tendency to twist and bend the saw blade so it gets back on track. This will only result in an uneven and rough cut. Instead, stop sawing and bring your blade back to the point where you veered off. Start sawing again on the line. Prevent binding with a nail. One problem you may encounter, especially when you’re cutting along the grain with a rip saw, is binding. Binding occurs when the kerf closes in on the saw. To prevent this, simply place a nail in your kerf. This will keep it open. Move the nail towards you as you saw. If you want to ensure your saw gives you years of cutting service, you need to take good care of it. By placing a simple sheath on your saw blade before you throw it back in the toolbox you can prevent your saw teeth from becoming dull and rounded, thus maintaining the sharp edge necessary for all your woodworking projects. Most new saws come with a sheath, but if yours didn’t or you lost the sheath, here’s how you can make a makeshift sheath with just a bit of garden hose. 1. Hold the saw up against a straightened section of an old rubber garden hose. Use a utility knife to cut a section of hose that’s roughly as long as the saw blade. 2. Cut a slit down the length of the section of hose. Make sure that the slit goes all the way through the rubber. 3. Slide the cut edge of the hose over the exposed blade of the saw. The stiffness of the hose should hold it in place over the blade, protecting it from nicks and bending. Got any other handsaw tips? Share them with us in the comments!